I was in search of something to photograph on this day and went to the usual lake shores, parks and marshes to see if I could catch a glimpse of the mergansers, mallards or any other shore birds that might be hanging around. No luck! I then decided to head toward the Military Establishment at the Red Dock in Penetanguishene to see what I might find there but something caught my eye and I instead decided to turn into the south end entrance to the Bay Moorings Marine entrance (this location is now vacant) to check out a possible beaver dam that I suspected I would find there. There was indeed a beaver dam in a well hidden marsh just behind someone’s home. There were no beavers to be seen either but as I was backing out of the parking lot I saw a bird in flight in the corner of my eye. I stepped on the brake and saw a killdeer flying fairly low to the ground. I got out and took a photo and then got back in the car. As continued to back up but once again I spotted something just to my left but this time – it was on the ground. Another killdeer was laying on a mound of rocks and again I decided to photograph her. To my surprise momma killdeer was sitting on four eggs and this of course thrilled me. I decided to give her some privacy and respectfully backed myself up, set my folding seat up near the car, mounted my camera on the tripod and took a few pictures of her going about taking care of her charge. I didn’t stay long and then went home to research what I could about the killdeer, their habitat and their incubation period. I decided there and then that I would study this beautiful little bird and photograph and record her time setting her eggs. It was June 4th – the killdeer incubation period is 22-28 days. The clutch size is usually 4 to 6 eggs with the eggs measuring about 3 to 3 1/2″ in size. The chicks were born on May 21st so I estimate momma killdeer had laid her eggs on or about May 1st. From everything I had read the chicks would be born self-sufficient and able to run along as soon as they are hatched and this proved to be true in my case. Unlike their female killdeer who sat so quietly and stately on her next the chick were incredibly nimble and quick on their feet – scattering in all direction as fast as they could. It was impossible to get a “family picture” of mom and her babies as I thought I might do. Instead I was lucky enough to get a couple of individual pictures of them as they ran around exercising their little legs and hiding behind the blades of grass around them. The pictures below are of momma killdeer, momma killdeer setting her eggs, and two of the chicks running about. All are way too cute. I truly enjoyed haven been given the opportunity to follow, study and photograph this little family. I learned the importance of respecting not only the killdeer but all the birds in their natural habitats. To ensure that these species thrive we must always give them all the respect they need. They are timid and shy creature and even if the appear to welcome your presence it is our responsibility to allow them all the privacy during this special time. I said my goodbyes the day the chicks were born feeling blessed to have had this chance to acquaint myself with them during this time. We got up about 7:00 am, had some breakfast, fed and watered the bird feeders and baths, had another coffee and while Earl walked the dogs I went back to bed for a little bit more sleep. When I woke up I was getting some text messages from my friend Doug in Ecuador so we chatted for a little while and at the same time Earl and I were planning out are day and time to take pictures of the Milky Way as it presents itself here in Arizona. Stellarium (a program that helps you navigate the skies and solar systems) told us that if the sky was clear tonight we would get our best pictures around 4:00 am but before sunrise of course. As it turns out the heavens will be cloudy tonight so we will plan on it for tomorrow night. Love Superstition Mountain but I will head your warning. I am still in pain from our hike up Picacho Peak. Good though for you and Channa. This is a level “difficult” clamber. Some vital statistics: Bottom to top, 3 miles, 3000 feet altitude gain, so 6 mile round trip. If you’re in excellent shape allow 4-6 hours and prepare to be sore. I’m in fair shape for an old guy pushing 70, and it took me 8 hours. It was a difficult night for Earl and I. Casey was showing some signs of distress: couldn’t walk or hold his head up; wouldn’t accept any food or drink; laid in my arms in total helplessness. Earl looked up a Veterinary Hospital in Casa Grande and we patiently waited until our time (2 hours behind you all) to take him for a check up. Tara called within this time frame and suggested a few thing that it could be such as Allergy to either food or bite or something foreign that he might have digested. She recommended Benydril and we had a couple of pills here so Earl gave him one. It took about 1/2 hr to see any signs of change but he could lift his head a bit and so we offered him water but he declined. We then offered him milk and he drank that. I decided to hand feed him part of his little breakfast and he accepted that also. However when we tried getting him to walk he was still very weak and was unable to do so on his own. The decision was made to take him to the vet and so we did. Colin and Sharon watched over Finnigan for us. So arriving at the Vet’s we registered him and had a nurse look him over. Earl took him outside to see if he could maybe stand by himself again – to his surprise Casey began to walk and after a short few steps did his business and seem to be less in stress. We cancelled the appointment at the doctors (vets) with the understanding that we would be bringing him back if he didn’t improve or got worse. Casey still is lethargic and laying quiet on the sofa next to me. The benydril did it’s job if was a bee sting or something like that however it may make him drowsy for a while. Got back home and prepared some Broccoli Salad for later and Sharon and Colin will be making some Jambalaya for 5:30 pm dinner later today. The sun is shining brightly and the air is warming more than our hearts. It’s so good to be alive. On another topic we are so blessed living among all the birds in this area. We must have hundreds of hummingbirds, finches, sparrows, woodpeckers and doves greeting us in song at dawn and at dusk. There are so many varieties that even though I am searches through my bird referencing books I trouble identifying single ones. I am attempting to do so but I might get some wrong so feel free to correct me at any time. 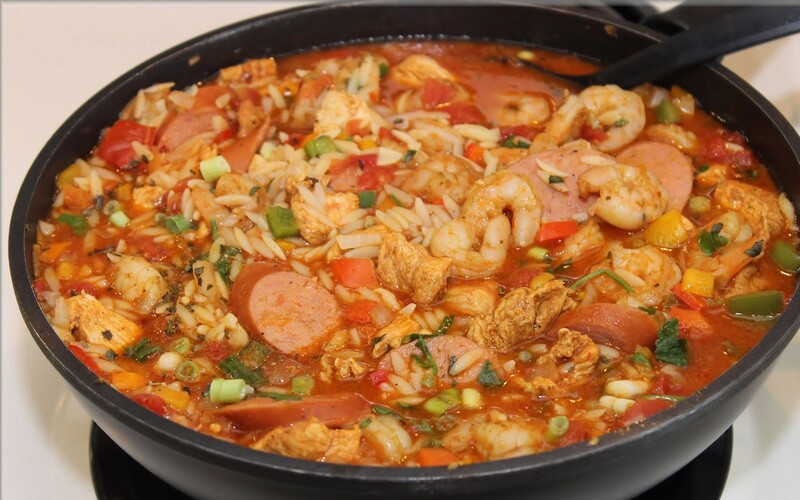 We have just come back from a lovely pot lot dinner with Colin and Sharon at their trailer and I must say Sharon’s Jambalaya was soooooooo….declicious. 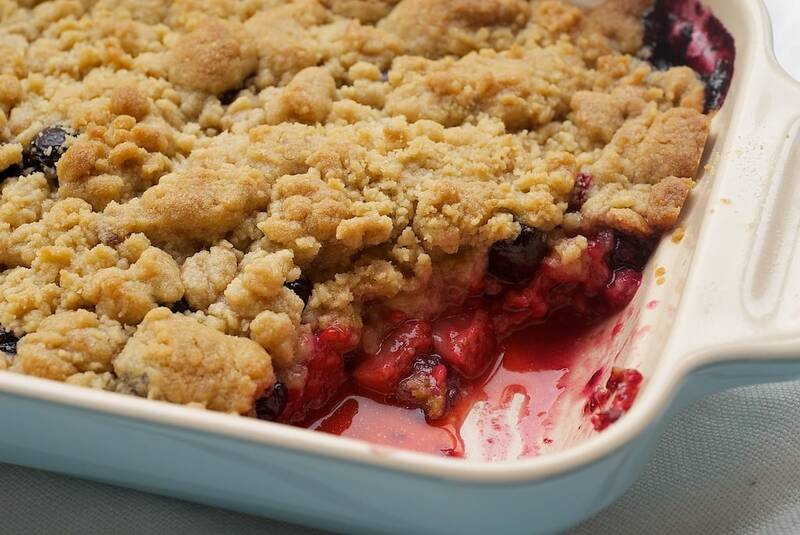 Our contribution was a Broccoli Salad and fruit cobbler for dessert. After a lovely cup of tea and some relaxing chit chat we returned to turn in for the evening. No one left hungry that was is for sure. Pictures taken from Google cause I didn’t bring my phone to take a picture of the real thing. So just a note to bring you up to date on Casey. He is pretty much back to himself tonight so thank goodness everything turned out for the best.